Life’s hard.. I don’t think many of us will dispute that fact. It’s full of a lot of difficult things and struggle, I’ve been there, you’ve been there.. in fact, I’m there RIGHT NOW. But despite hard times life can also be really good, sometimes you simply have to rearrange the way you do things or even your attitude in order to appreciate what you have. Summers out of school are hard for our family. 1. I am a GREAT “alone” person. I love being alone. It probably has to do with me being an only child. On top of that I work at home. 2. My girls (who are adopted from foster care, who have trauma issues and delays) have a really hard time with the “unstructuredness” of summer. Side note- yes, all kids do better with structure, the difference with mine is that while most kids can recover from having less structure , mine have a much more difficult time. This can result in my 8 ½ year old having a drop down temper tantrum in the middle of the floor for 30 minutes because she didn’t get to choose the snack she wanted.. a la three year old. The past 2 years these two issues have resulted in difficult summers. 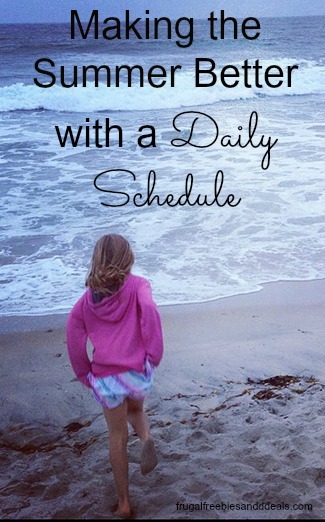 This year to make everyone’s lives better we have implemented a daily schedule. We have a laminated template of the normal daily events like getting up, making beds, eating, play time.. Then if we have something new that day we can simply use a sticker to put in the new event. We ALL love it. Everyone knows what to expect and what is expected of them. There is less resistance to things like chores (that are scheduled) or private, in room, reading time. So I feel like I have time slots that I can work (fairly) un-interrupted, we have a daily craft time that I can help and interact with them if needed, they have TV time on the schedule. And everything has structure and my daughters don’t have to feel like the day is just out there and open (scary for them). It’s great and makes our lives SO much better. And anything our family can do to help my very sweet girls (who have endured so much hardship in their short lives) to do better is great in my book. Now, yes we are only a few days in, but over all it is really working. I highly recommend this to most any family, give it a try! Allstate Good Life has a new brand vision called “Good Hands for the Good Life”.Do you have any great tips or Good Life moments to share that make your lives better? Please put them in the comments, we would love to hear.